Walter William Pitcher was born in Alveston in 1841, the son of Henry, a carpenter from Charfield, and Susannah, a local girl from Alveston. The family lived at Alveston Down in the 1841, 1851 and 1861 Censuses. In 1861 Walter was 18 years old and working as a sawyer. By this time his father, Henry, was described as a carpenter and wheelwright (both trades for which later generations of Pitchers were well known locally) and another son, Arthur had also become a carpenter. Walter William married Anna Maria Williams in Bristol on 7 July 1862. The photograph on the left was taken much later in their lives. The Pitchers were members of the Non-Conformist Congregational Church which is probably why they married in Bristol. It is possible that Walter and Anna Maria began their married life at number 12 Gloucester Road. The previous occupier, George Hodges, left the house to move into his new home at Laburnum House, number 6 Gloucester Road, about this time. Although Anna Maria was born in Newbury, Berkshire on 23rd December 1839, she was the daughter of James Williams, the Thornbury brushmaker. James’s wife, Sarah (nee Stacey) was from Lambourne, Berkshire and in 1841 Census the family lived in Newbury although they appeared to move to Thornbury around 1845. Anna Maria was the niece of John and Emma Williams who owned number 12 and they probably offered the newly married couple with a place to live. The 1871 Census for number 12 Gloucester Road shows Walter was a sawyer aged 30 who was born in Alveston and that Anna Maria was a dressmaker aged 31 from Newbury. By the time of the Census they had had two son Edgar Walter who was three years old and Francis H. J. Pitcher who was one year old. Edgar had been born on 6th December 1867 and Francis in 1869. Two other dressmakers were living in the house; Walter’s 19 year old sister Elizabeth Pitcher and Anna Meredith who was 14 years old. The special drainage rate books of 1880 and 1885 confirm that Walter William Pitcher remained a tenant of John Williams at number 12 Gloucester Road for some time. The 1887 rate book shows that Walter had moved to another house owned by John Williams at 22 Gloucester Road. Edmund Cullimore’s abstract of title to the land which now includes Shen and West Shen shows that on July 5th 1888 he sold a small piece of the property to Walter Pitcher and a new house was built for the family. This became 24 Gloucester Road. 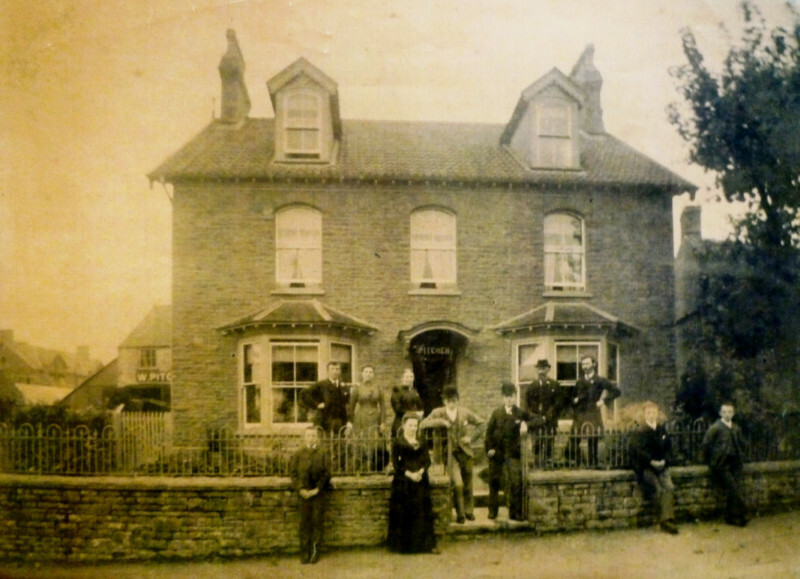 The 1890 Rate Book shows that the family had moved to their new home at 24 Gloucester Road. It was a larger house and as the 1891 Census shows they now had room for other boarders. The 26 year old Congregational Minister from Glamorgan David Evans was lodging with them. Mrs Pitcher’s niece Gertrude Williams aged 12 years was visiting the house. Of the Pitcher family; Edgar had become a Solicitor’s clerk, Annie was a dressmaker like her mother, Leonard Pitcher was an apprenticed coach-builder, presumably working for his father and Albert was a grocer’s assistant. By the 1901 Census, Walter was calling himself a carpenter and builder. The business which was started in a small way in the early 1880s had gradually built up until there was a staff of 18 made up of carpenters, blacksmiths, bricklayers, plasterers, labourers, stone masons, painters and decorators. Straps and coffins were made on the premises, iron bands for the wheels of the traps were made and shaped in the yard. Average wages were £1.00 to £3.00 per week according to the skill of the worker. Gradually more buildings were built and more equipment was installed. All materials had to be man-handled or transported on hand cart or horse cart. Two of his six sons helped him in the business. We understand from locals who were builders themselves that the Pitcher firm of builders were extremely well respected for the quality of their work – the term ‘class act’ was used when referring to them. Their strength appears to be the work they did in building and repairing traps and carts and making and repairing wheels. This work required a higher level of craftsmanship than general building work. Of course this fact led to the firm’s demise when the motor car replaced horse-drawn vehicles. Note – the census records and electoral registers show that the Pitchers regularly took in lodgers. They seemed to provide accommodation for ministers of the Congregational Church. By the 1901 census, many of the children had moved away. Walter and Anna Maria were left with only three children at home, Annie, Charles and Augustus. The 1911 census shows Walter William and Anna Maria still lived at the house. Walter was still working as a builder. Of their children, only Annie Maria aged 38 and unmarried was living at home. They had one unmarried boarder, Ann Squire, a retired lady’s maid aged 81. She was born in Dodington, Somerset. Walter died on 27th May 1912 aged 71 years. Anna Maria died on 23rd May 1922 aged 82 years.